The Tampa Bay Rays visit Yankee Stadium on Tuesday, September 26, 2017 to play the New York Yankees. The probable starters are Blake Snell for the Rays and Luis Severino for the Yankees. The opening line for this matchup has Tampa Bay at +155 and New York at -165. The Rays have a 77-76-3 over/under record and a 74-82-0 run line mark. The Yankees are 84-71-0 against the run line and have a 81-71-3 over/under record. The Rays have a 76-80 overall record this season. Starting pitcher Blake Snell has a 4-6 record with an earned run average of 4.01 and a WHIP of 1.34. He has 105 strikeouts over his 121.1 innings pitched and he's given up 107 hits. He allows 7.9 hits per 9 innings and he has a FIP of 4.28. The bullpen has an earned run average of 3.83 and they have given up 460 base hits on the year. Teams are hitting .232 against the bullpen and they've struck out 480 hitters and walked 192 batters. As a team, Tampa Bay allows 8.3 hits per nine innings while striking out 8.3 batters per nine innings. They are 9th in the league in team earned run average at 3.99. The Rays pitchers collectively have given up 1,283 base hits and 618 earned runs. They have allowed 185 home runs this season, ranking them 19th in the league. Tampa Bay as a pitching staff has walked 482 batters and struck out 1,292. They have walked 3.1 men per 9 innings while striking out 8.3 per 9. They have a team WHIP of 1.27 and their FIP as a unit is 4.16. As a team Tampa Bay is hitting .244, good for 25th in the league. 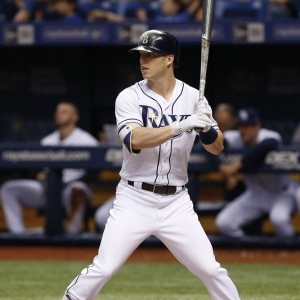 The Rays hold a .423 team slugging percentage and an on-base percentage of .316, which is good for 22nd in baseball. They rank 24th in MLB with 8.3 hits per game. Logan Morrison is hitting .243 with an on-base percentage of .352. He has 120 hits this season in 493 at bats with 83 runs batted in. He has a slugging percentage of .515 and an OPS+ of 134. Corey Dickerson is hitting .278 this year and he has an on-base percentage of .322. He has totaled 159 hits and he has driven in 61 men in 571 at bats. His OPS+ is 118 while his slugging percentage is at .487. The Rays have 1,293 hits, including 222 doubles and 220 home runs. Tampa Bay has walked 518 times so far this season and they have struck out 1,488 times as a unit. They have left 1,071 men on base and have a team OPS of .739. They score 4.27 runs per contest and have scored a total of 666 runs this year. New York has a 86-69 overall mark this year. With an earned run average of 3.03, Luis Severino has a 13-6 record and a 1.05 WHIP. He has 221 strikeouts over the 187.1 innings he's pitched. He's also given up 146 hits. He allows 7 hits per nine innings and his FIP stands at 3.08. The bullpen has an earned run average of 3.40 and they have given up 395 base hits on the year. Teams are hitting .205 against the Yankees bullpen. Their relievers have struck out 625 batters and walked 214 opposing hitters. As a team, New York allows 7.9 hits per nine innings while striking out 9.7 batters per nine innings. They are 5th in the league in team earned run average at 3.78. The Yankees pitchers as a team have surrendered 1,210 base knocks and 582 earned runs this season. They have given up 186 home runs this year, which ranks 18th in Major League Baseball. New York as a staff has walked 484 hitters and struck out 1,488 batters. They give up a walk 3.1 times per 9 innings while they strike out 9.7 per 9. Their team WHIP is 1.22 while their FIP as a staff is 3.91. As a team, they are batting .261, good for 8th in the league. The Yankees hold a .444 team slugging percentage and an on-base percentage of .338, which is good for 3rd in baseball. They rank 8th in MLB with 9.0 hits per contest. Brett Gardner comes into this matchup batting .263 with an OBP of .347. He has 152 hits this year along with 61 RBI in 578 AB's. He maintains a slugging percentage of .420 with an OPS+ of 100. Aaron Judge is hitting .281 this season and he has an OBP of .416. He has collected 147 hits in 523 at bats while driving in 105 runs. He has an OPS+ of 164 and a slugging percentage of .610. The Yankees as a unit have 1,401 base hits, including 254 doubles and 227 homers. New York has walked 590 times this year and they have struck out on 1,335 occasions. They have had 1,139 men left on base and have an OPS of .782. They have scored 5.3 runs per game and totaled 822 runs this season.